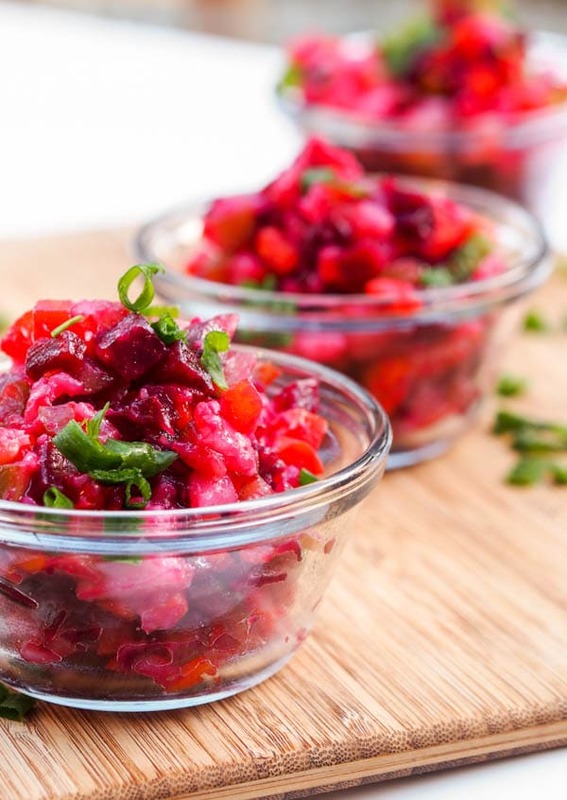 A classic Russian Vinaigrette Salad, also known as Vinegret is made with boiled carrots, beets, potatoes and Israeli pickles. Both gluten-free and vegan this salad is crispy and refreshing. Though D and I just left for our road trip 18 days ago, it feels like we’ve gone forever already. Luckily only after two and a half weeks away, we are already reuniting with my parents, aunts uncles and cousins in New Orleans tomorrow afternoon. There will be 14 of us in total and I cannot wait to see us take over the Best Western hotel where we’ll be staying. I love love love family vacations. We used to go up to Bromont, Canada for a few days of skiing wintery wonderland bliss every year when I was younger, but now that those trips have come to a halt, I’m super excited to see everyone coming together in a new location. A true Southern city. One I have heard so much about and cannot wait to spend time in. Not exactly the place for a healthy living diet I have heard, so I am looking for to some true Southern culinary indulgences. So with my Russian family gathering on my mind, it’s only appropriate I share a classic Russian recipe today. 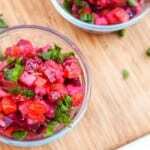 A lot of Russian recipes can be a bit heavy, lots of meat, cheese, mayo, potatoes, and while this Russian Vinaigrette Salad also has the classic beets and potatoes this dish is perhaps a tad bit lighter than some of my other traditional favorites. Compared to a standard US, leafy green loaded salad Russian Vinaigrette Salad with beet, potato, pickle and carrot may sound a bit off at first, but don’t let that discourage you. The beets, carrots and potatoes are boiled until soft, then cubed, along with the briny crispy pickle and all mixed together. Olive oil or mayo binds everything together and you are left with a crispy refreshing salad, completely leafy green free. Make sure to look for Russian style pickles. My family always used Israeli pickles that we buy at the Russian food store. There are nothing like the sweet dill pickles you’ll find served with your burgers and fries. These are much more salty, briny, marinated. More sour and salty than sweet. Other than that you can’t go wrong with this simple yet intriguing Russian Vinaigrette Salad. It’s honestly a family favorite that my mom makes all the time. For those who aren’t vegan you can serve this the proper Russian way with a bit of marinated herring. Another strange one for my US readers, but a Russian favorite as well. Herring is a key element of Russian cuisine and I have to admit it goes perfectly with this Russian Vinaigrette Salad. In terms of dressing for this salad you could either use olive oil, mayonnaise or sour cream. My family always went the olive oil or mayonnaise route and it works well both ways – I encourage you to split the salad batch in two and try the salad dressed with olive oil and with mayonnaise, that way you can try both versions! Please let me know what you think of my Russian Vinaigrette Salad in the comments below! I love beets too but surprisingly add them rarely to my recipe but this is definitely a great salad where they really shine! This is one of my favourite dishes to make 🙂 I’ve only made it with olive oil though, never though to add mayo. You reminded me that I should definitely make this again soon! I think this looks wonderful! Thanks so much for sharing at Simple Lives Thursday; hope to see you again this week. 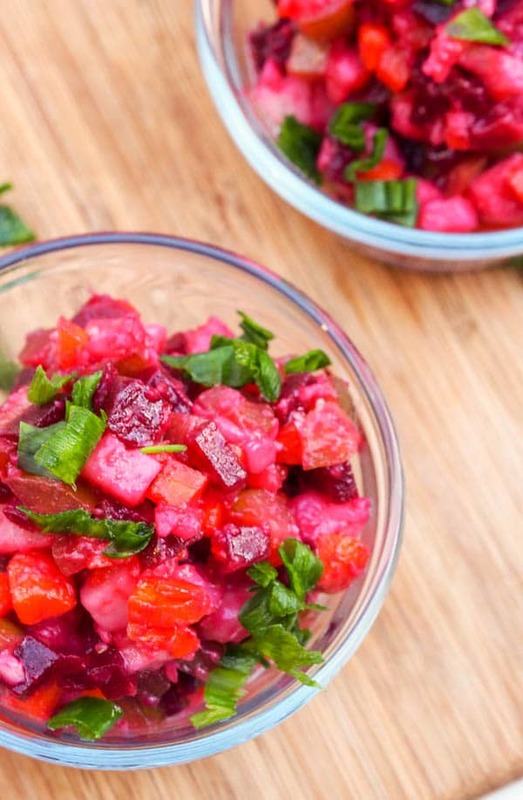 We love beets and your salad looks delicious, I can’t wait to try this one. Thanks so much for sharing with Full Plate Thursday and hope you are having a great week. can you tell me what Israeli pickles are or what to substitute? I did some research and looks like Israeli pickles can also be called Mediterranean pickles (https://www.google.com/search?q=israeli+pickles&espv=2&biw=1366&bih=667&tbm=isch&tbo=u&source=univ&sa=X&ei=jde1VPD8G8KBgwTm-YOoDA&ved=0CB0QsAQ&dpr=0.9) which might be easier to find. Overall the Israeli pickles are fully fermented (whereas the standard American pickle is served “half sour” and made with cucumbers with a rougher and tougher skin. The Israeli pickle is fully sour and a bit more salty as they have more salt in the brine. (http://www.haaretz.com/blogs/modern-manna/1.540250) Hope that helps!